Because trail running offers changing terrain that can include dirt, mud, rocks, roots, and other obstacles, runners may not realize that their regular pair of road running shoes isn’t sufficient for the demands of the trail. Trail running earns athletes positive benefits for both mind and body, and in our opinion has many benefits over road running. This includes less car traffic to deal with, quieter surroundings, and more interesting terrain and scenery. Trail running shoes differ a lot from one shoe to another. The traction on the sole varies from big lugs for mud and soft ground to smaller, stickier lugs for running on rocks. The midsole sometimes features a rock plate – a thin lining of hard plastic for protection against sharp objects (like rocks!) – but this adds weight and not every shoe has this. Finally, uppers differ to emphasize durability, breathability, and water resistance. Having the right equipment will provide for a better trail running experience and keep you running comfortable. 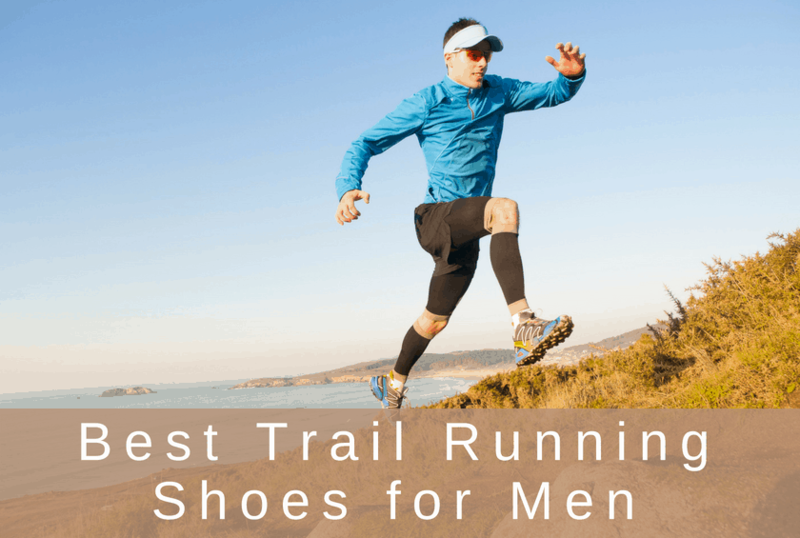 Here are the best trail running shoes for men that can help your jog, race, or marathon proceed more smoothly. If you are looking for women’s trail running shoes, make sure to check out this article. 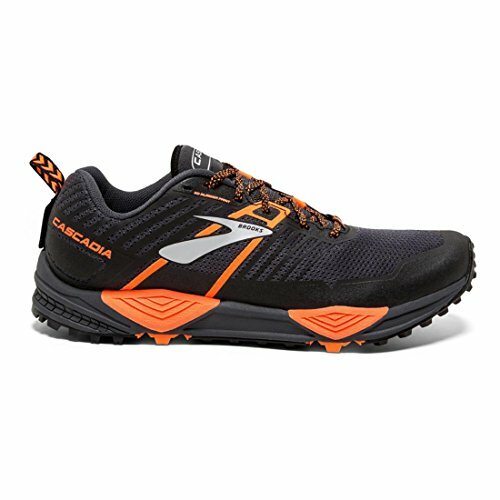 The new Cascadia 13 follows a line of Brooks trail shoes that aim to provide protection and comfortable cushioning for trail runners. With a 10mm midsole drop and neutral support, the Cascadia accommodates most runners with medium to high arches. 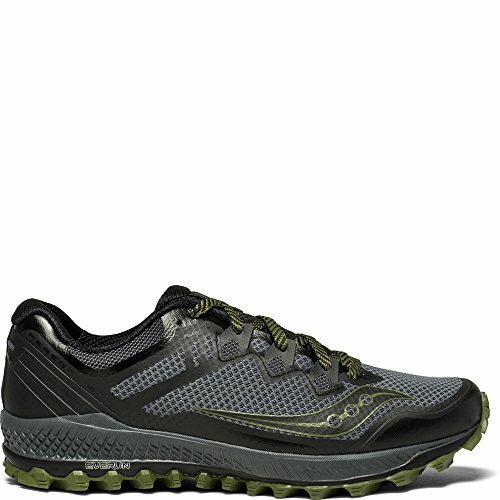 Great traction keeps you steady on the trail, and most runners appreciate the generous amount of padding Brooks uses. In comparison with other trail shoes, the toe box is relatively wide, but could still be too narrow for some wearers. New in version 13 is a seamless upper that lightens what was a fairly heavy shoe. It also gives the Cascadia a sleeker look while still managing to keep out dust and debris. The lacing has been redesigned for a more secure fit. And a pocket was added at the top of the tongue to stuff excess lace and keep them out of the way. Overall, as a comprehensive trail running shoe, the only drawback to the Cascadia 13 is its lack of waterproofing (they do offer a Gore-Tex version). However, the mesh outer that allows water in also allows your feet to dry quickly, so for many runners, it’s a decent trade-off. 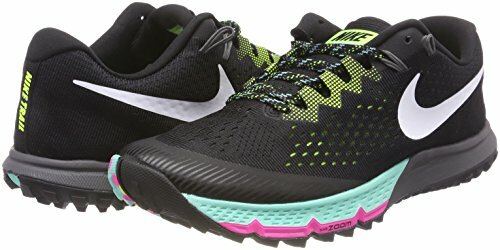 The Nike Terra Kiger is a lightweight trail shoe that has medium lugs for traction across a variety of surfaces along with a breathable mesh upper that still manages to keep your foot locked in and secure. A foam midsole with Zoom Air units gives comfortable feedback on rough trails. The tiny “air bags” support the foot without putting too much material between the ground and your feet. Keep your footing secure with the exaggerated “lugs”- a waffle-shaped sole keeps you from slipping. While some wearers may find the rubber sole distracting, it does have exceptional traction a variety of trail surfaces. The upper mesh, which Nike calls “Flymesh,” lets your feet breathe and keeps the shoes lightweight. While your feet might get wet as a result, the breathability will help them dry in any conditions and allows them to drain and dry very quickly. While there is no rock plate for extra protection in the sole, the Terra Kiger does have a top cap to protect your toes against jamming your feet on rocks and roots. The versatile Challenger ATR 4 is ideal for light trails where you want a ton of cushioning to protect your feet. A breathable mesh upper keeps runners comfortable, but the eye-catching design is probably the most noticeable feature of the Challenger ATR 4. 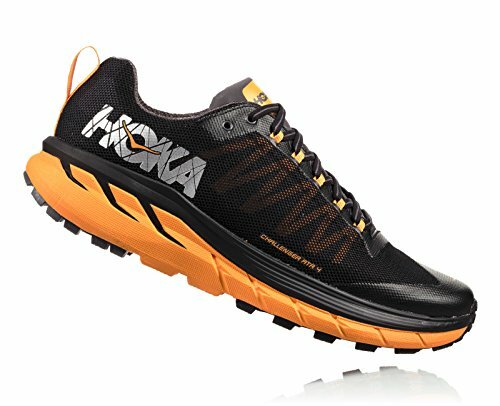 Hoka One One maintains that these trail runners can handle both trails and roads, plus any other surface you decide to tackle. A toe guard area offers protection from trail obstacles, increasing the overall durability of this pair. Just looking at the Challengers, the amount of cushioning is clearly visible. Along with interior cushioning, there’s also a 4mm lug sole that gives impressive traction. 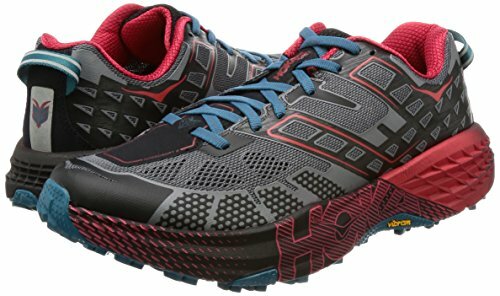 Plus, the Meta-Rocker helps propel runners forward, but with less bulk than other Hoka trail shoes. The Challenger ATR 4 offers balanced cushioning; however, runners who are unfamiliar with the rocker design may find it difficult to adjust to. Overall, the shoe can feel bulky, although it’s lightweight for the features it packs. 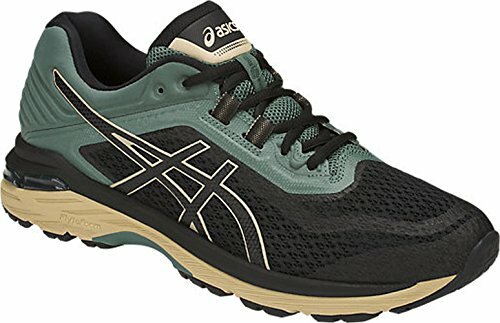 The Asics GT-2000 6 Trail is perfect for light trails or for a runner who mixes road and trail. This shoe isn’t made for heavy-duty trail running; however, it is one of the few trail shoes designed for runners who overpronate. With gel cushioning, Asics’ GT-2000 6 Trail aims for both comfort and performance. The cushioning helps absorb impact but also supports movement through each gait cycle. At the midsole, Flytefoam uses “organic super fibers” to maintain responsiveness as you move combined with a lightweight design. Supportive and forgiving foam helps cushion both neutral positioning and overpronation of the feet, accommodating normal to low arches and runners with flat feet. And although the cushioning is substantial, it’s sturdy and reactive rather than plush and squishy. Between the high-density foam midsole and the gel cushioning system, there’s little opportunity for blistering or rubbing. Plus, high-abrasion rubber outsoles add durability on the exterior of the GT-2000 6 Trail running shoes. 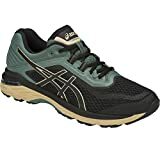 Still, the overall focus is on responsiveness and comfort, making these a good option for runners who need stability and versatility in their running shoes. Saucony’s Peregrine 8 is clear about two things: comfort and traction. Saucony’s classic and best-selling trail shoe offers some of Saucony’s most advanced technologies in a high-performing trail shoe. It starts with the outsole, which Saucony calls the PWRTRAC. Its high-profile gripping lugs give great traction. They’re sticky on rocks and abrasion-resistant, giving you ultimate control over the trail. The aggressive lugs aren’t ideal if you plan on road running in the Peregrines, but you’ll be thankful for the depth of the traction on rough and rocky surfaces. Inside, the Peregrine 8 uses a PWRFOAM midsole that provides nice rebound as your feet hit the ground. Saucony promises smoother landings and stronger takeoff, and the foam falls into their “firm and responsive” class. Breathable mesh makes these a top choice for warmer climate running, although they’ll drain well in wet conditions. A toe cap offers protection against trail hazards, but depending on the fit of this somewhat narrow shoe, your toes may not hit the cap area. Extra cushioning is helpful for reducing pain from plantar fasciitis in trail runners, and the traction and stability help add a level of confidence to walking and running activities. Salomon boasts a “monster grip” with the Speedcross 4, and we don’t plan to argue. 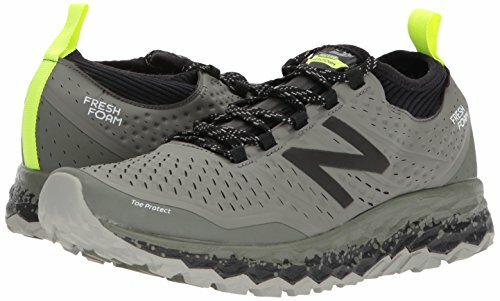 These trail running shoes almost have a baseball cleat-like look, with deep traction lugs that are ideal for mud and soft trail conditions. The entire midsole and liner use EVA for a close fit and cushion support. But the shoes are relatively narrow, especially in the toe box. 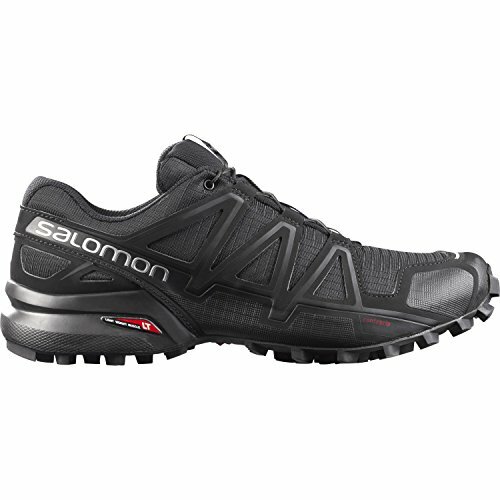 Salomon has started producing the Speedcross 4 in a wide fit if you need more room. The OrthoLite sockliner uses a unique foam plus an EVA heel cup to create a responsive and supportive cushioned surface for your heel. It also drains water quickly to keep your feet dry and cool. Around the base of the Speedcross 4, a mud guard offers some protection against seepage. While most trail runners use a toe cap, the mud guard is a unique feature that helps with wet and mucky conditions. Altra’s Lone Peak 4.0s might be the versatile trail running shoes you’ve been looking for. Altra notes that they’re best for hiking, trail running, and backpacking, and we’d have to agree. A wide toe box is the top feature for these shoes, ideal for the natural splaying of toes no matter how wide or narrow your feet are. Just look at the underside of the shoes, and you’ll see the difference between these and your previous toe-cramping sneakers. They also feature a zero-drop – this means the heel to toe are even off the ground. Compare this to most shoes where the heel is raised higher than the toe to slightly angle your foot. The zero-drop is designed to mirror barefoot running. You might notice the zero-drop if you run on hard pack dirt or pavement. But for most trails, you won’t feel the difference. Overall, the Lone Peaks are ready for any obstacle, and their durability is evident in the minimal seam abrasion-resistant mesh construction. While they’re “Mid Mesh,” there’s also a “trap” that keeps out dirt, dust, sand, and more. The mesh is breathable, but you won’t have dirt-covered socks at the end of a messy run. Durable rubber outsoles, aptly named “TrailClaw,” help you get a grip, and the hiking boot style gives ankle protection that you won’t see in other trail running shoes. The New Balance Hierro combines exceptional grip and stability of a Vibram sole with bootie-style construction that molds to each runner’s feet. While the drop is higher than you might expect from a Vibram-styled trail running shoe, the flexibility and sizing options of the Hierro v3s make them a great trail shoe. The HypoSkin upper helps shape to runners’ feet while allowing for natural movement, and the sock-like fit keeps debris out. Inside, Fresh Foam keeps feet comfortable and cushioned with every step. While two width options can accommodate runners with normal to wide feet, note that the Hierro v3s are significantly narrower than previous versions. Despite the accommodating Vibram sole, the uppers prove too narrow for many runners that are looking for more room for natural toe splay. That said, the no-sew materials help avoid irritating seams that can cause blisters with a too-tight fit. At the same time, the sock fit maintains a snug fit but stays flexible throughout your run. Named after top ultra runner Karl “The Speedgoat” Meltzer, this Hoka One One trail shoe was designed according to Karl’s specifications. Along with an array of eye-catching color options, the Speedgoat 2 includes all the features you need to tackle the trail. A wide midsole and wider toe box helps maintain stability and keeps toes comfortable, plus a reinforced upper promote durability. Vibram lugs make up the outsole, giving grip on a variety of trail conditions. Midfoot cage construction assists with stability, while mesh keeps everything breathing nicely. The EVA midsole offers cushion and a custom fit for every wearer. Shock absorption is also a trait that comes with EVA foam. For vibrant and responsive runs, the Speedgoat 2 is a top pick for best trail running shoes for men. The new Ride combines Salomon’s snug fit and grippy soles with a wider toebox and more versatile design. The Ride is ideal for rocky areas or hard pack dirt. Profeel Film, a unique Salomon feature, provides protection against rocks and roots while keeping the shoe lightweight and flexible. There’s also an OrthoLite sockliner, which supports the heel and adds cushioning. Although Salomon suggests the Sense Rides for multiple weather conditions, they’re better-suited to drier trail conditions. That said, the traction grip helps you maintain sure footing in slippery conditions. Inside, an Endofit internal sleeve helps “hug” your feet, improving responsiveness. The mesh exterior helps promote breathability and allows for quick drying in damp conditions. Speed laces keep things convenient, reducing the time it takes you to suit up before a run. A glove-like fit helps tailor the shoes to every foot type, plus allows for adjustments on-trail as feet expand. VIBE technology uses a unique foam to help reduce the impact on your body with each step. 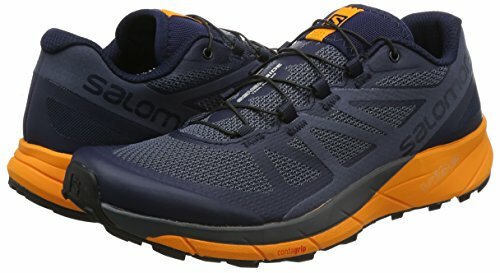 For shock absorption and an accommodating fit, Salomon’s Sense Rides are one of the best trail running shoes for men.